It's crazy to think that we've made it to the last Wednesday in May! But here it is, nonetheless, with a brand new sketch for your creative pleasure. Below you'll find Sketch 282. Create cards, scrapbook layouts, home decor, treat containers, mixed media, etc. using this week's sketch and be sure to link your project below for a chance at the weekly My Favorite Things Gift Voucher worth up to $20. The My Favorite Things Creative Team has been busy getting creative! Let's see what they have up their sleeves for Sketch 282! Francine went for a very literal and super colorful rendition of this week's sketch. 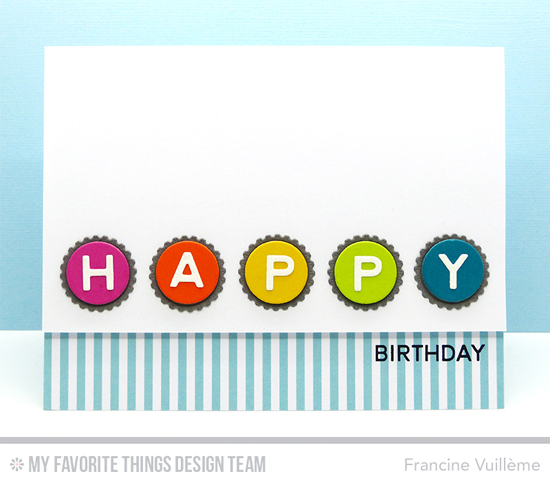 Using the Bottlecap Letters and Bottlecap Die-namics, she spells out a cheerful happy to celebrate someone's birthday in style. We've had a great month with Rubeena Naz as our Guest Designer! You can follow her at her blog A Rare Ruby for more of her inspiring designs. Rubeena's design is more interpretive of the sketch setting the end table, lamp, and couch from the Make Yourself at Home along the line created with the circles in the sketch. Her sentiment serves as the line at the bottom of the sketch. Such a cozy scene! 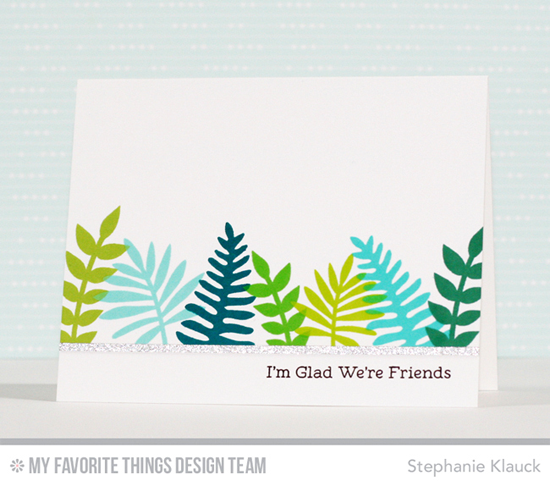 Stephanie kept things über simple with two stamp sets and an array of cool colored inks in her gorgeous card. The repeated leaves from the Large Desert Bouquet stamp set make for a lovely greeting. This would be a fantastic design for a sympathy card. Instead of circles, Anna creates an adorable line of bear friends heading for a super duper group snuggle with one delighted bunny from the Snuggle Bunnies stamp set. The Split Triangle Background stamp creates the perfect subtle background for her design. 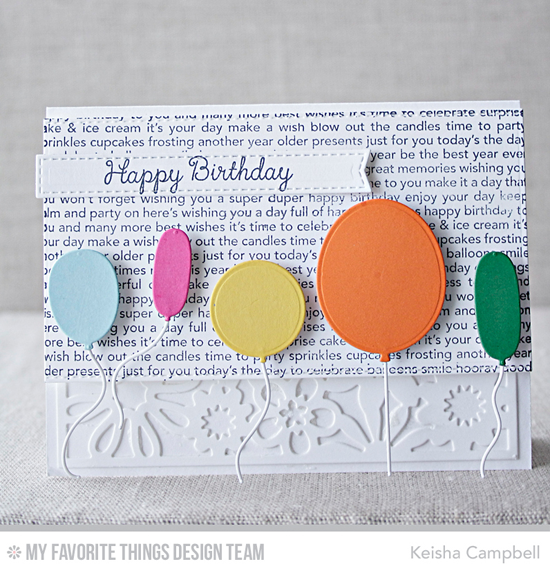 Five colorful balloons against a neutral stamped and die cut background are cause for celebration on Keisha's birthday card. What a lovely way to say, "Hey, I'm glad you were born!" Five Mini Modern Blooms steal the show in this design from Kay. They look awfully glorious set against the patterned paper from the Tranquil Textures Paper Pack. Jodi transforms the circles into five colorful hearts in her rainbow inspired design. 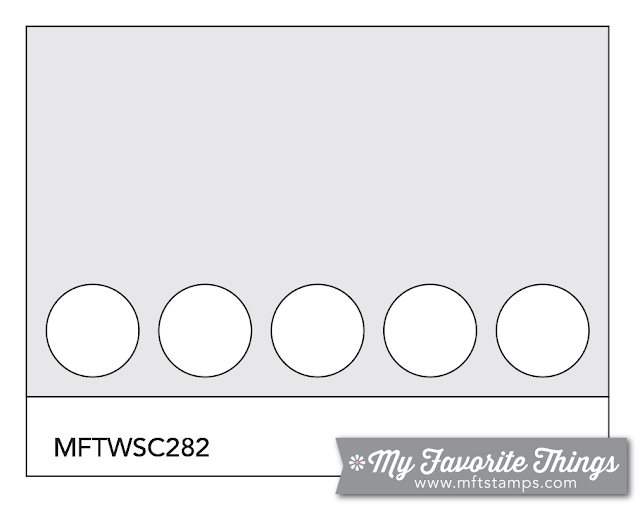 The heart from Blueprints 15 is the perfect size for five across horizontally on an A2 card. Those Blueprints sure do have a gajillion options, don't they? Congratulations, Tobi Crawford! You are the randomly selected winner of last week’s sketch challenge. You can view all the entries for last week’s challenge HERE. You have until Tuesday, May 31st, at noon EDT to add your link and be eligible for the prize of up to $20 in MFT Cash to be spent in the MFT boutique. Winners are chosen at random, so everyone has a chance! The weekly prize is a $15 Gift Voucher to My Favorite Things, but if you use MFT stamps and/or dies in your project, you’ll receive an extra $5.